Lord Byron once called Montenegro’s coastline the planet’s most beautiful encounter between land and sea and I reckon he might have been onto something. Bar is the first port of entry when approaching from the South and that’s where we headed. It was a 107nm run up to Bar from Vlore – too far for a day sail so we planned a slow overnighter. Which was just as well as the wind was on our nose the whole way. We burned quite a bit of fuel getting there and by the time we got there at 9am the next morning our diesel tanks were almost empty. Perfect as fuel in Montenegro is quite cheap, and I’d assumed we could get duty free fuel like last time. Two problems with this, you can only get duty free fuel when leaving Montenegro and we needed some on entry and the fuel jetties weren’t interested in providing a small amount (ie 600litres) for the hassle it involved. So no duty free fuel this time. At 92c a liter its still the cheapest I’ve paid for a while. The marina cost us 90 euros for the night we were there, a lot cheaper than Budva and Porto Montenegro. The cost of a 7-day cruising permit for Montenegro was also 90 euros, courtesy of being a catamaran. We took a quick walk around the pleasant waterfront, before hopping in a taxi for the 5km ride to Stari Grad (Old Town). Stari Grad was up on a hill overlooking the new town with an imposing Venetian Castle overlooking some nice cobbled streets. We finished off our day with some of the best octopus we have had so far. Next day we had a great sail along the coast with a southerly blowing up our behind. We turned into the Bay of Kotor past the twin forts that guarded its entrance where the wind dropped off to nothing. As we turned the corner and headed South into the second bay the wind picked up to 40 knots as it funneled through the narrow opening between the 2 bays. We motor sailed past all the bunkers and submarine bays left over from the war. Then the wind dropped off to nothing again as we motored over to the channel that separated the 2nd Bay from the 3rd Bay. This is the Balkans impersonation of the Norwegian Fjords. As we popped out into the 3rd and innermost bay, we had a great view of the 2 islands, each with its own church. We did a sail past with lots of photos in the overcast conditions and then headed up to the North end of the bay for a look see. Then we pointed south and headed back 6nm to Kotor. The wind was on the nose and at one stage, managed to hit 40kts yet again. We decided against anchoring and instead pulled into the small marina that borders the old medieval town. We could literally step off the back of the boat and cross the road to the market outside the city walls. Perfect at 69 euro a night. Next morning we were off in a hire car to see this beautiful country. First stop was the capital where Dee had to visit the embassy to sign some papers. Getting there involved driving along a very scenic coastal highway before cutting inland through some awesome mountains before dropping down into a plateau with a large lake. Podgorica, the capital wasn’t much to write home about as it was pretty well flattened during the war. We briefly called into the Hard Rock Café to get some decent internet and then we were off. 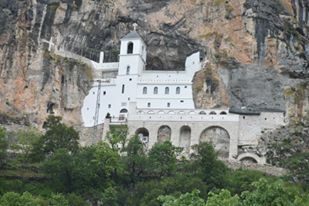 Our first stop was the Ostrog Monastary, perched 900m above the Zeta Valley on the side of a cliff. We were two of the million people that visit here annually. It was built in 1665, God knows how (but then He would), its white building backs onto 2 large caves and is very impressive. We continued on our way along the narrow twisting and steep road back toward the Bay of Kotor. Driving down to the bay, we stopped and admired a huge waterfall that tumbled into the bay. We checked out the beautiful seaside towns of Risan, with its Roman mosaics, and Perast, with its fine Captains’ Houses and waterfront restaurants. 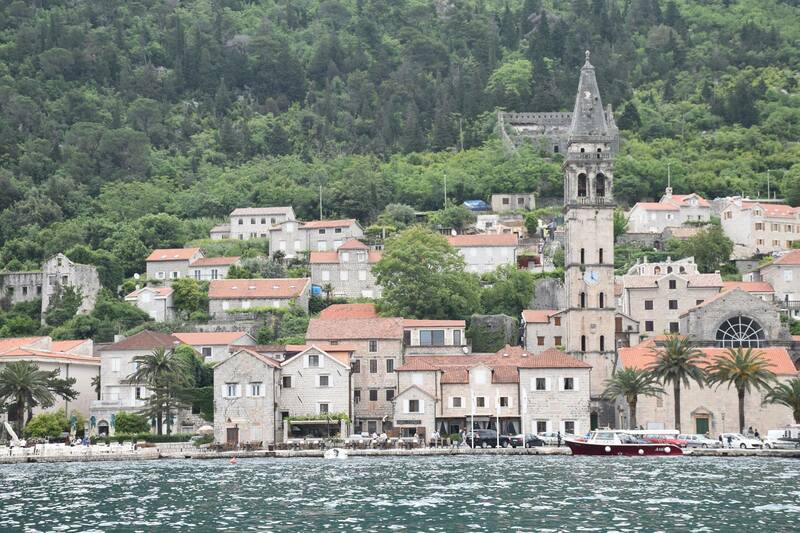 Perast has a great sea-faring past, evidenced by Peter the Great having sent some of his Russian naval officers there to study maritime science in his days as Russian Tsar. On the way back to the boat we passed numerous mussel farms and managed to find one that sold us 3kgs of very tasty mussels that we boiled up and consumed for dinner. Next morning it was up and then up – to the top of the Castle of San Giovanni that overlooked the medieval town of Kotor. 1350 steps later (give or take), we were 1200m up overlooking the Bay of Kotor for some views to die for. The weather was starting to behave itself so we got some really good photos. Then it was down to the car again for a drive out to Budva. We took the coast road out of Kotor, a narrow winding road along the side of the waters edge, until we got to Tivat and then the highway to Budva. Budva was a really cool town. We parked and then walked along the boardwalk to the marina to check it out. Then we walked through the old city walls into the old town. Lots of cool shops and restaurants in the narrow walking streets. There was a castle on the point, which we went through and got some really good views from the top. Then down to the cool beach bars for the obligatory mojito or two. We finished the day off with a return visit to Porto Montenegro, the marina/glamor hub that La Mischief called into 3 years ago. We wandered the boardwalks through the trendy shops and restaurants and checked out some of the boats. Got told off for taking a picture of the THREE boats owned by His Royal Highness Prince Khaled bin Sultan bin Abdul Azziz al Saud (there’s a mouthful) called Golden Odyssey, Golden Odyssey 2 and the support yacht Golden Shadow. 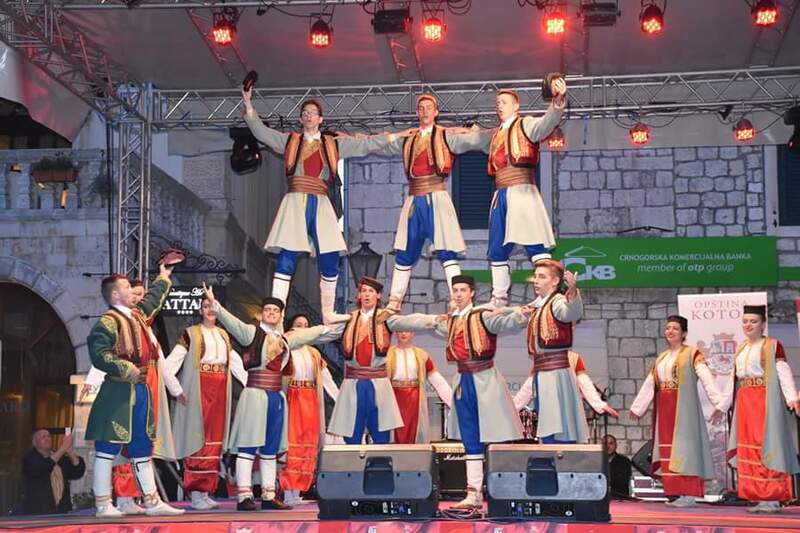 Then it was back to Kotor to check out the celebrations for Montenegro’s “10 years of independence – 1000 years of culture” anniversary – pretty cool. Next morning we tried to check out but couldn’t find the harbour master. The guy from the Marina tried to call him without luck. Eventually we found him but it was getting too late to leave. What the heck, there’s worse things than another day in Kotor. 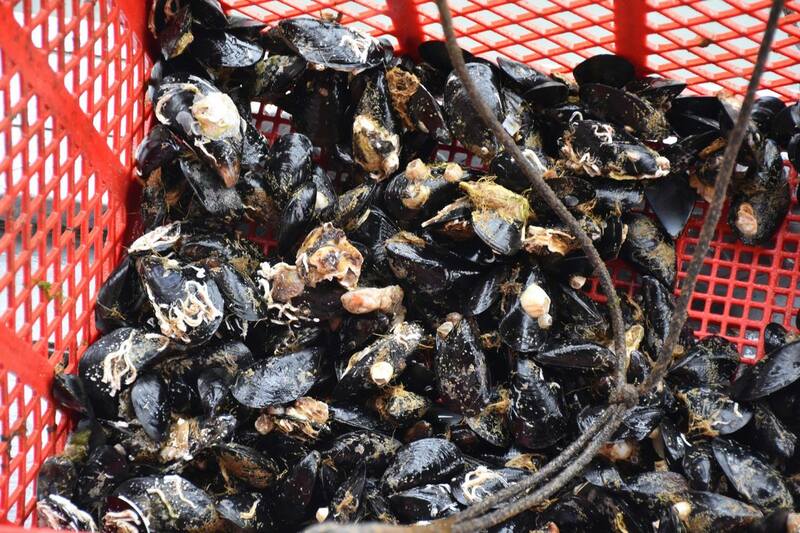 So off we went on a long walk along the foreshore, stopping for a nice lunch of mussels and fish. It also provided us with a bit of shopping time (Dee) and a bit of blogging time (Steve). Next morning, we located the harbour master, checked out of Montenegro and we were off to Cavtat in Croatia. 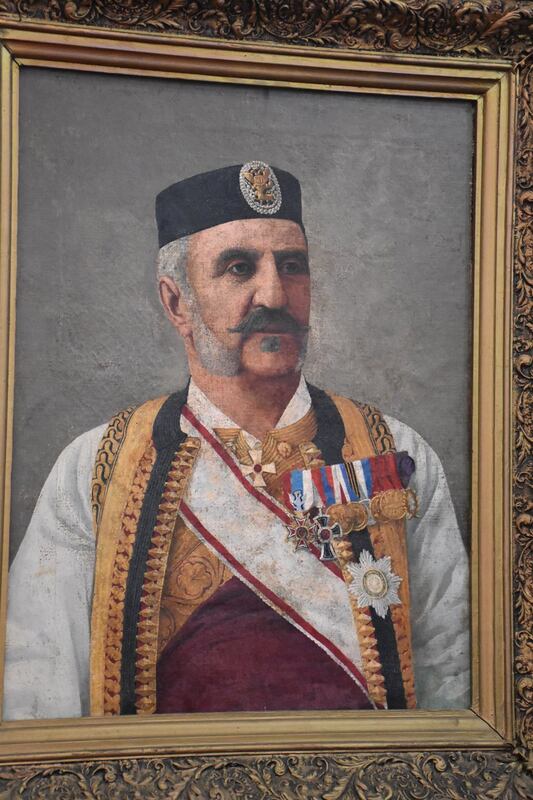 This entry was posted in Montenegro and tagged budva, kotor, Ostrog Monastary, Perast, porto montenegro by stull61. Bookmark the permalink.